EACH month, thousands of cash-strapped and disillusioned Sydneysiders are packing up and leaving the city in search of a better way of life. New South Wales had the highest rate of exodus of any state or territory in the September 2018 quarter, with most departing locals heading north to Queensland. 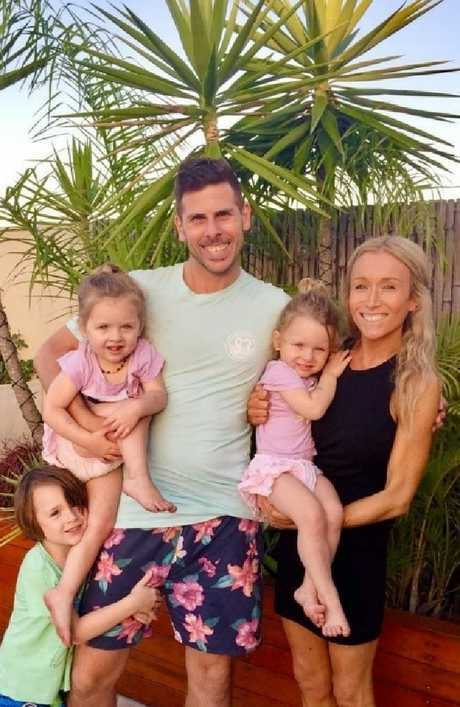 Alysha Sladden and her family joined the cohort of leavers in January, bidding farewell to their hometown to move to Burleigh Heads on the Gold Coast, driven by housing affordability. Ms Sladden said when she fell pregnant with her and husband Michael's second child, it turned out they were having twins. "Our two-bedroom unit in Dee Why wasn't going to be sufficient anymore, so we started looking for somewhere else to live," Ms Sladden told news.com.au. While house prices in Sydney have slid sharply over the past 18 months, the cost of a home large enough for their growing family was still going to be prohibitive. Photos on Facebook shared by friends who had moved to Queensland sparked an idea, and the couple began looking at properties in the Sunshine State. 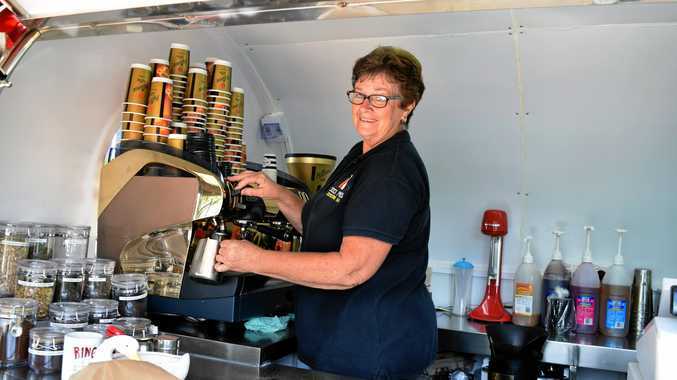 "We realised we could get so much more bang for our buck," Ms Sladden said. "If we stayed and bought a house in Sydney, we would've had this huge mortgage hanging over our heads. I would've had to return to full-time work straight away too. You only get one shot at the early years with kids, and it's nice to be able to spend time with them." For one-third of the cost of a comparable property on Sydney's northern beaches, the Sladdens snapped up a lovely four-bedroom house with a big yard and a pool in Burleigh Heads. Alysha and Michael moved north to Queensland from Sydney to be able to afford a family home. "It was beautiful on the northern beaches but this is something else. It wouldn't have been as much fun in Sydney with so much debt and far less money," she said. "I was a bit sad to leave family, especially when we have young children. I was a bit nervous too. But the fun of it and the huge benefits have surpassed our expectations. It's such an adventure. "Of course, we're not working as much, and so I think we're not as stressed as we were in Sydney. The kids probably benefit from that." Australian Bureau of Statistics data showed 11,490 people moved from NSW to the Sunshine State in the three months to September, with another 7239 residents relocating to Victoria. It mirrors results from the July quarter, where 12,802 people moved from NSW to Queensland and 8126 south to Victoria. A new survey has found 23 per cent of Millennials would move interstate in order to be able to buy their first home or upgrade to a bigger one. Financial comparison website RateCity.com.au polled a range of Australians and also found 20 per cent of gen Xers would relocate due to housing affordability. "The entry level prices are lower, so it takes less time to save for the all-important deposit," RateCity.com.au researcher director Sally Tindall said. "It takes almost double the time to save a deposit in Sydney as it does in Brisbane, and it's a similar story in Adelaide, Perth, Hobart and Darwin." The time taken to save a deposit in each capital city. 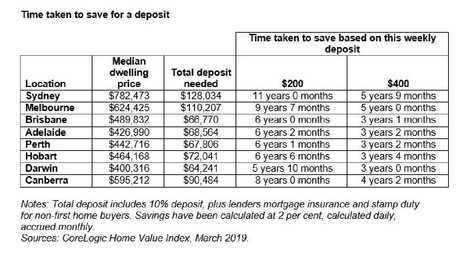 The median dwelling price in Sydney of $782,473 would require a deposit of $128,034, which would take someone putting away $400 a week a whopping five years and nine months to save. By comparison, Brisbane's median price of $489,832 would need $66,770, which would take three years and one month to build up, Ms Tindall said. "You can afford a nice family home without having nothing left over. It gives people breathing space and financial options that you might not get in Sydney and Melbourne." People from Sydney were the most likely to consider moving for the sake of housing affordability, with 32 per cent of Harbour City residents open to uprooting their lives, she said. 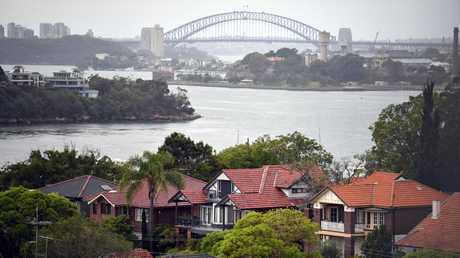 "Prices have come down in Sydney, but even with that, it's still hard to get on the ladder," Ms Tindall said. While Ms Sladden was initially sad about leaving behind her family and nervous about making such a big move, her family "couldn't love it more". "You look at the numbers and the lifestyle, and it's a no-brainer," she said. Plenty of her Sydney friends are following suit too, she said. They've inspired others to contemplate the change, just as her state-changer mates did for her. "The mothers' group I joined in Sydney (five years ago) when I had my first child, all but one have moved on," Ms Sladden said. Most were living along the stretch of southeast Queensland's coast in either the Gold Coast, Brisbane or the Sunshine Coast, she said.